Writing a credible historical novel is like doing an obstacle course with your hands tied. A significant challenge for me in writing The House at Zaronza was to find out about nursing from a French viewpoint on the Western Front during World War I, where about a third of the novel is set. Countless books exist about “the war to end wars” but few of them give much space to French experiences of nursing. French women ran farms, worked in munitions factories and did other war work behind the lines, but were seen as removed from the war. They were wives, mothers, sweethearts, widows, daughters. Things were very different in World War II, when women played an important part in the resistance. The nearest women came to the front lines was as volunteer nurses. But, at the beginning of the war, the French government told women to stop volunteering, so great was the flood of requests to set up hospitals and organise ambulances. They also wanted women to finish the harvest, which had been interrupted by mobilisation. 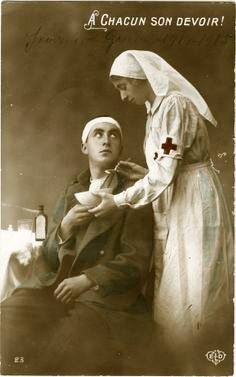 When it became obvious that it would not all be over by Christmas 1914, the need for nurses at the front was recognised. My main character, Maria Orsini, becomes a volunteer nurse, first at a converted convent in Corsica. She then applies for training under a military nursing scheme in 1916. She works in a field hospital near Verdun and then transfers to Amiens during the German spring offensive of 1918. Plenty of contemporary accounts by British nurses exist, but there are few in French that I could find. Happily, I discovered a memoir written by a Claudine Bourcier. This redoubtable character told it as it was. She was in her fifties and so somewhat older than most of her colleagues. Naturally, her account is biased, but her authentic experience was incredibly valuable to me. She wrote about the training nurses received, the illnesses and injuries they had to treat and the advances in medical practices. She also described the jealousy that sometimes existed between nurses, who wouldn’t let others treat “their” patients; the predatory doctors who regarded themselves as lords of all they surveyed; and the stultifying bureaucracy that got in the way of providing care. I pieced together what she wrote with other scraps of contemporary experience (not all French) and books and articles on the organisation of military medicine. This enabled me to avoid some anachronistic howlers and give colour to the fictional background. Despite their contribution to the war effort, French women did not receive the vote until after the liberation in 1944. Some claim that the right-wing Charles de Gaulle allowed them the vote only because women were thought to be more conservative than men. In 1918, things went back to the way they had been before the war, except that there were rather fewer men around. Corsica had been turned into a hospital island, a place where the war wounded came to recuperate – and in some cases to die. The convent just outside Zaronza had become a base hospital and each week, received its contingent of the wounded, who had been gassed, machine-gunned, mortared and torn apart by shells, patched up in the dressing stations, and then operated on in the hospitals behind the lines. Those considered well enough to travel were sent on. After a train journey of several days and a sea crossing they arrived here. Some were in a poor state, their dressings unattended to and infection setting in. This was the result of lack of personnel to clean and re-bandage their wounds after their operation, and a journey during which they received little care. Some were sick with dysentery, piles, trench foot and other illnesses. These men required more nursing care than the wounded. A few with tuberculosis also arrived, although they should have been consigned to isolation hospitals near the Front. These men were put in a separate ward in the basement. You always knew the ones who were going to die. They had a haunted look about their eyes, as if they could already see beyond this life to something we couldn’t yet make out. This entry was posted in Fiction, Historical Fiction and tagged French nurses in World War I, historical accuracy, historical fiction, historical research, Nursing in World War I, The House at Zaronza, World War I by nessafrance. Bookmark the permalink.